This step-by-step guide on how to make fresh lemon ginger tea is quick and easy plus, this tea is delicious and good for you! 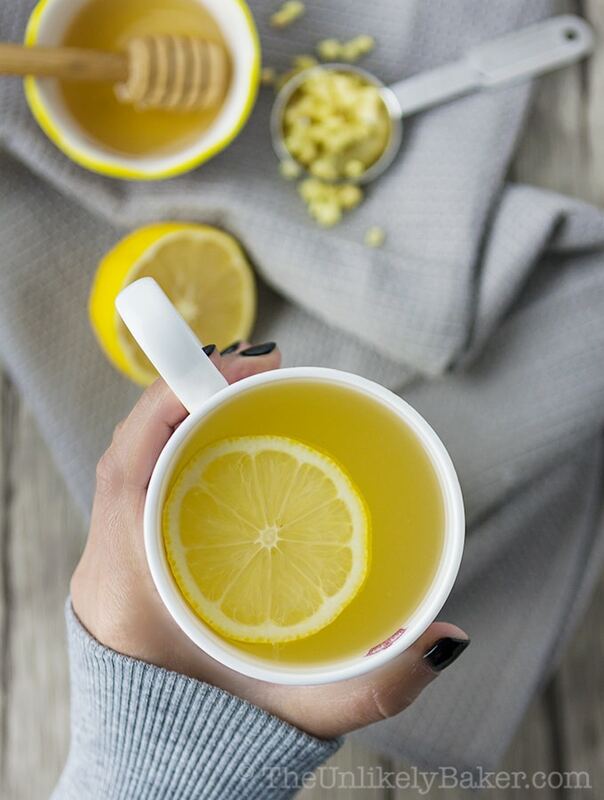 Drink it to boost your immune system, to help digestion or simply to relax at the end of the day. I’ve said it once and I’ll say it again, winter and I, we’re not a good match. In fact, I think we’re enemies. Every year, once the weather starts getting cooler, I start getting sick. I’m allergic to a lot of medicines too so I resort to DIY home remedies and I’ve gone through a lot over the years. I’ve shared one of my favourites – Turmeric Golden Milk – a while back and if you haven’t tried it yet I strongly encourage you to. It’s delicious and it’s packed with lots of exceptionally healthy stuff. Another favourite is fresh lemon ginger tea. I used to buy the ready-made ones but they’re not potent enough for me (and some brands taste like cardboard TBH). So I made my own. And it’s delicious! Just the perfect spice, tang and sweetness to soothe even your worst throat itch. I like it so much I drink it even when I’m not sick. I’m sure you’ll love it too. Ready to see how to make fresh lemon ginger tea? Buy good quality ginger. And I mean try to stay away from the old, fibrous ones. Fresh ones are the best. You don’t really need to go organic and in fact I’ve found that organic ginger tastes a little bland (or is that just me?). In any case, fresh is better. Peel and dice. I’m not really a peel and dice kind of girl but this I can do. I use a spoon to scrape off the skin from the ginger and by dice I just mean chop it into the smallest pieces that you can. It doesn’t have to be perfect. And in fact if you end up with big-ish pieces no worries, it just means you’ll need to steep your tea longer. and steep for at least 20 minutes. The longer you steep, the stronger the ginger kick. and it works just fine. Set that aside. 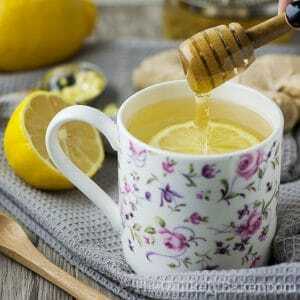 Pour your ginger tea into a cup, put fresh lemon juice, some honey, stir and enjoy. That’s it! It’s the easiest thing in the world, isn’t it? But I promise this tea is soothing and calming and tastes really good. 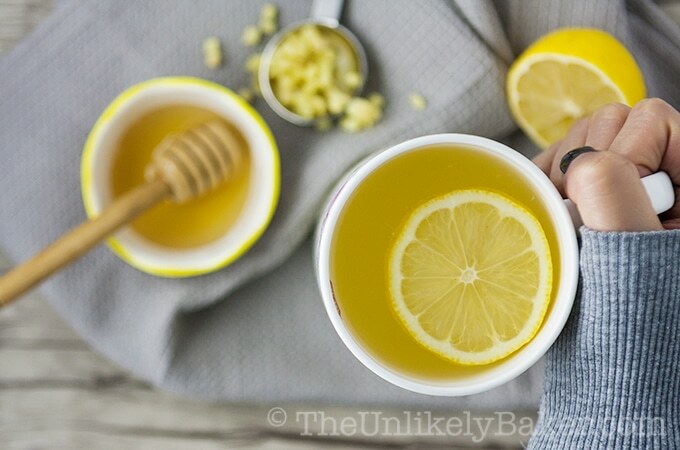 This step-by-step guide on how to make fresh lemon ginger tea is quick and easy plus, this tea is delicious and good for you! Put 4 tablespoons ginger in a teapot with 34 ounces hot water. Steep for 20 minutes. Strain into 2 10-oz cups (see note). 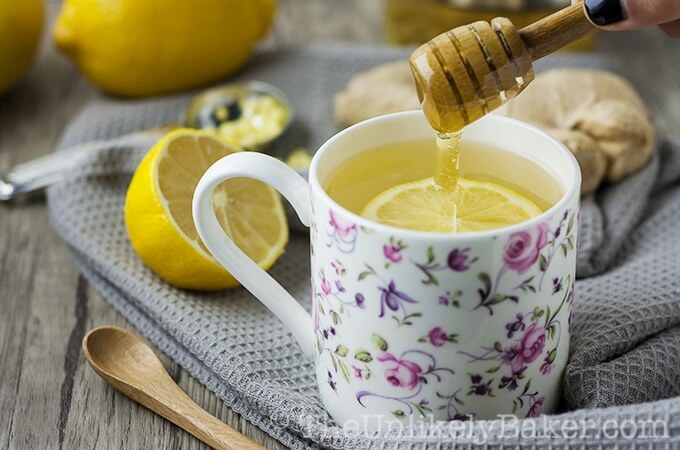 Put 2 tablespoons lemon juice in each cup and sweeten with honey. Stir and enjoy! Once you pour your first two cups, you can add more hot water into your teapot and allow your ginger to continue steeping. It's good for another 2-3 cups. Did you make fresh lemon ginger tea? How’d you like it? I’d love to hear all about it in the comments section below. This is become our new favorite tea. We make a pot almost everynight it is so delicious. Thanks for the simple recipe! This is so delicious and helps keep our sniffles at bay. We make it with little bit more ginger. One of my favorite things winter or not. I like your photographs too. Your fresh lemon ginger tea has been a staple at our house. We love it so much we drink it even when noone is ill. And it tastes much much better than the tea bags. Thanks for the recipe! I’m so happy to hear that Shari! Fresh is wayyyy better than the tea bag version 🙂 Hope winter is not too bad where you are! My grandmother used to make us something very similar. I love your recipe, the hubby wants his with a little extra zing. It works wonders. My hubby was feeling under the weather for a few days and we tried everything. We make your lemon tea and he already feels better. Amazing what home remedies can do. Thank you! I made some of this yesterday and it tastes so good. I added more ginger, I liked the spice. I think some of colds are going away as well. Thank you! I love ginger lemon tea. It’s so easy and healthy! Ginger tea is a staple in our household. Great post! I love this idea, especially for when I’m feeling under the weather! Mmm! This sounds pretty good right about now with it being freezing outside! Sipping on some ginger tea right now :). Love how it aids digestion after a meal. 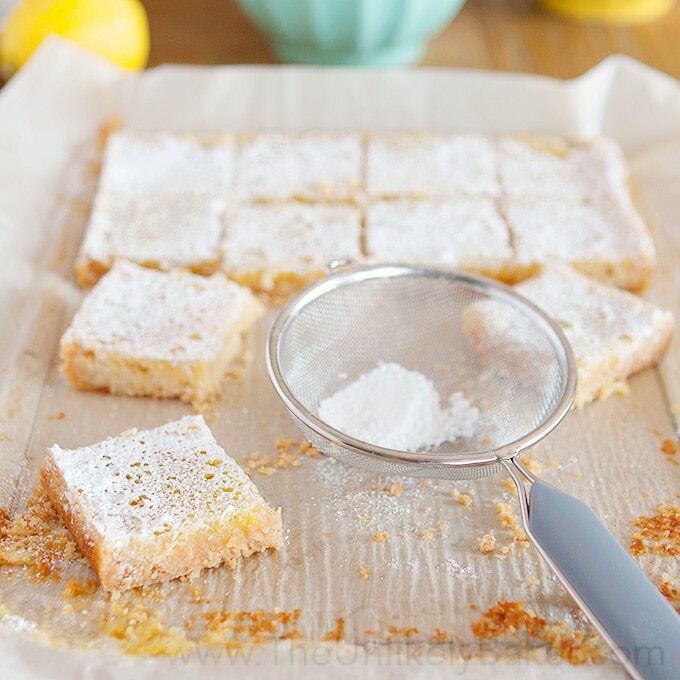 Adding lemon is a great idea for flavor and a boost of vitamin C. Thanks for sharing this recipe! I have fresh lemons and ginger root in my kitchen. 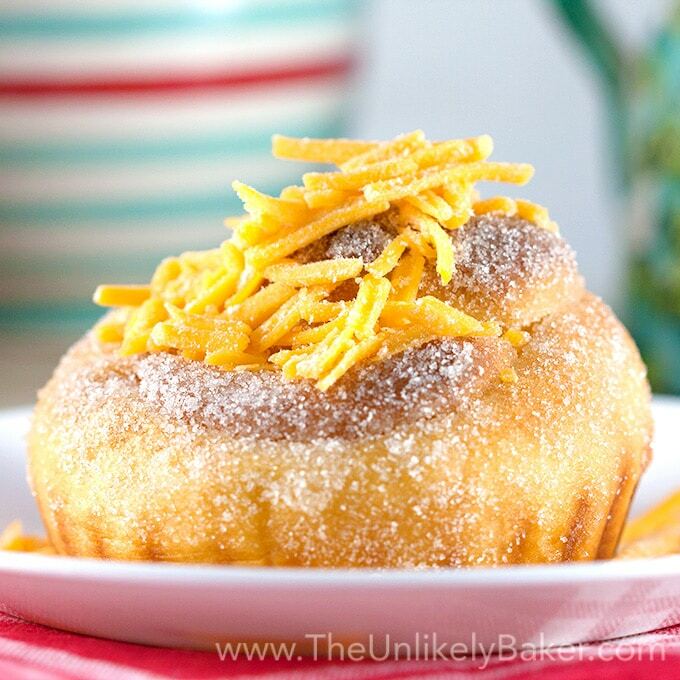 Totally going to make this tomorrow morning! I love fresh ginger tea! It’s part of my morning routine and makes me feel energized. 🙂 I also love it minus lemons for stomach aches. Thank you for this! I have made my own fennel tea for the longest time. But I will definitely have to try making my own Lemon Ginger. I’m not a tea drinker but my husband sure is; my kids also. This one though actually looks pretty good 🙂 I may give it a try. My mom would always make this when I was younger. Those stuff is so good for your digestion! I am one of those crazy lover of tea in different versions. My favorite way of taking them is in the form of Lemon Tea, Ginger Tea and Green Tea and they are the good way to turn a lazy morning in to a fresh one! Oh I’ve always loved lemon and haven’t thought to try ginger until now! It’s a great combo! Hope you like it! Lemon ginger tea is my go-to fix for when I’m feeling under the weather. It always soothes my throat and chest and helps me relax and sleep. 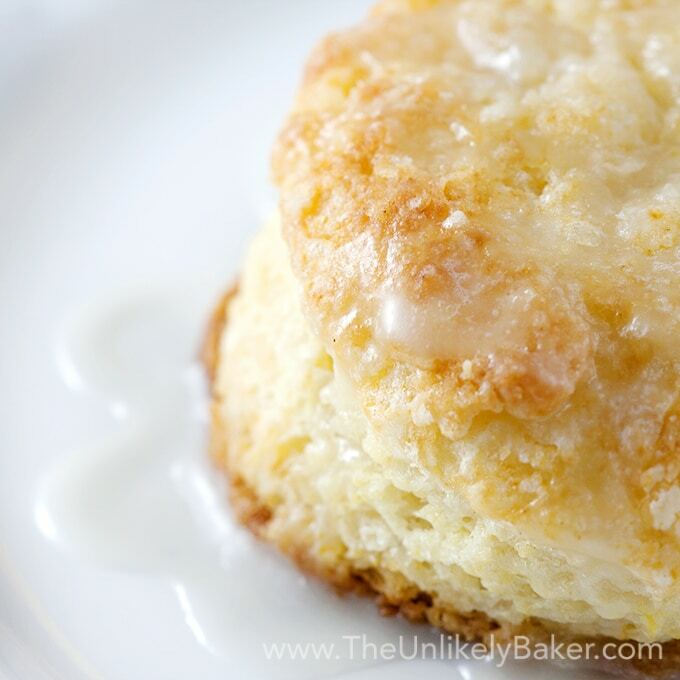 Thanks for sharing your recipe and beautiful photos. It’s great isn’t it? So simple but so many benefits 🙂 Thanks Barb! I love a great cup of tea, and this sounds like a lovely combo! Cheers! This sounds amazing. I love ginger tea when I’m sick. I’ll have to try this one out! I don’t like winter either. 🙁 Cold weather is no fun. If we had fresh ginger, I would definitely make this tea tonight. It sounds wonderful. Thanks Kimberly! Yeah, winter is no fun at all. I cannot wait for warm weather! Very interesting! I make a mix of honey and ginger (put it in the Bullet or Blendtec) and put it in the fridge so when I want to make tea, I just scoop some out and add lemon. This reminds me of that. I am gonna make myself a cup right now:) Sounds so refreshing! This sounds delicious! I usually drink black tea but it might be time to change things up! I could not agree more! Especially in the winter, this would really help. This is my absolutely favorite tea! It’s so detoxing and makes the body so warm! this sounds great – i like the taste of ginger & def need to detox & relax a little – especially after this past weekend – I’m def going to try! Hope you like it Hal. And hope you have a better week! The timing of me finding this post is quite a coincidence since I am home sick from work today! I love lemon ginger tea, it is SO soothing, but I have never made it from scratch like this. Seems so obvious now that I read this! Thanks for sharing. Ginger tea is what I rely on when my throat starts getting itchy and a nasty cough is on the way! I love the idea of making it in the french press – awesome!! It’s pretty great isn’t it? I love it, even when I’m not sick! Oh no, sorry to hear that. Hope you feel better Lori. So easy and so great for digestion. Perfect to drink after meals, especially at night! I am a tea drinker and this sound delicious. Now to go get everything I need to make this delicious looking tea. Some great tips! Im going to be switching to a tea only regiment soon. My husband loves all kind of teas! I will have to make this for him one morning! Awesome! Hope you and your husband like it! Oh I hate that feeling, when I know I’m about to get a cold. Hope you feel better! And I hope the tea helps. 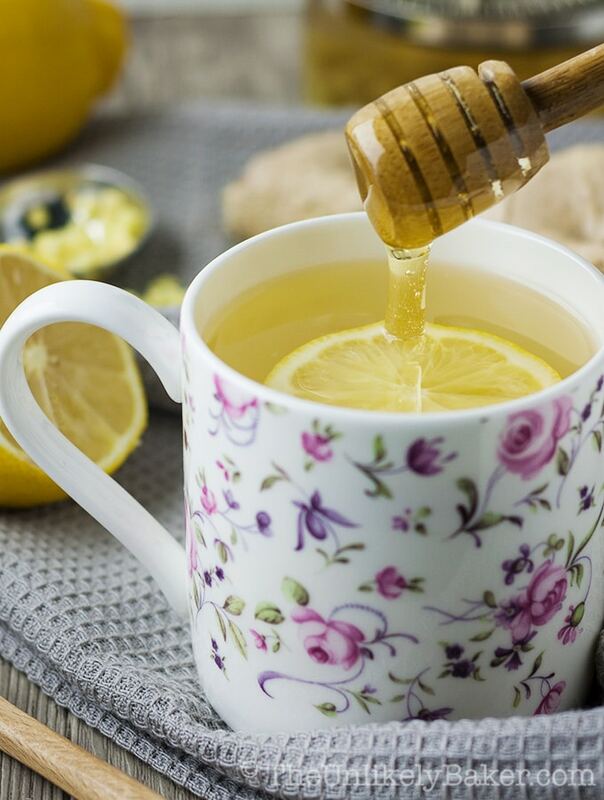 A cup of lemon ginger tea sounds wonderful right now. Boy what a difference in taste when you use fresh herbs. This makes me want to grow my own ginger so I have have it all the time! 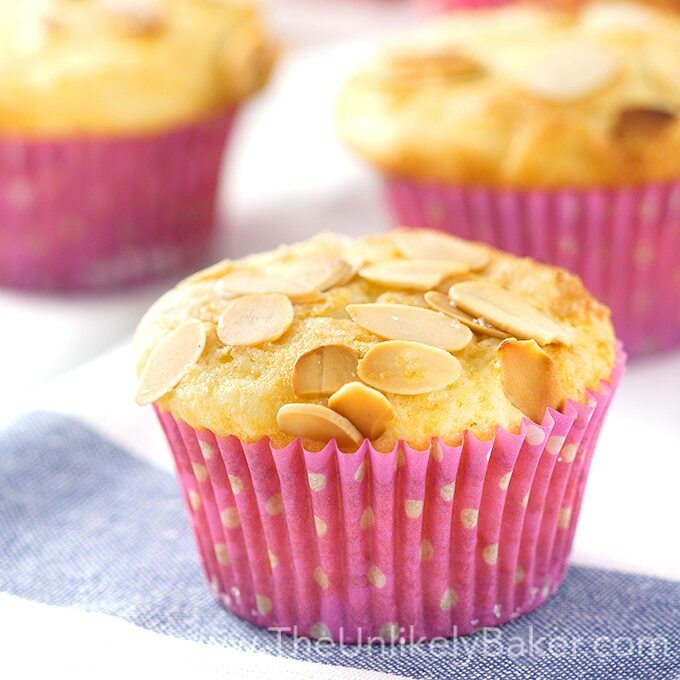 It’s really very different from the ones you buy at the store – in a great way! Tea is definitely good for a variety of reasons. This one sounds great! I am bookmarking this to try out! Thank you! I always have this when I have a really bad sore throat. It’s seriously so good! Isn’t it? So good and so effective! This sounds great, I need to give it a try! I so needed this – thank you! LOL me too! I almost forgot about allergies. Come to think of it, I really only get along with summer haha. This sounds really good. I have to make that some time soon. Thank you for sharing! This is one perfect healthy drink for the cold weather. This is something I would drink even when I’m not sick too. Thanks for sharing. I just got a french press the other day and have been looking for more reasons to use it. This sounds perfect. I’ve been relaxing w/a cup of chamomile at night but I’ll give this a try. Chamomile sounds lovely too 🙂 Hope you like this tea Christine! This is so soothing, refreshing and most of all good relief for sore throat, cough and colds. This is such a nice simple recipe. And perfect for the winter, especially with all the bugs going round! Oh yeah absolutely! Whenever we start feeling even a little bit of colds coming, we start drinking this tea! This looks amazing and simple. Definitely going to try it. Thank you! My fiancé swears by lemon ginger tea and you’re right.. Store bought isn’t usually potent enough! Definitely going to bookmark this! we were recently on a cruise and they should have served this to all the people that were sea sick. Ginger is so good for your belly. This looks wonderful! Will have to make some tonight before bed and see if that helps me fall asleep. Me and winter don’t get along either. I can’t handle the cold and I bundle up in a million layers when I go outside. I love the idea of this tea using fresh ginger. Everything is natural and healthy and so good for you. I know what you mean about some bought teas tasting not so good. Thankfully, I’m feeling good right now, but I would happily sip on this! We are in for a snow storm tomorrow so I can totally see this tea happening 🙂 Stay warm, Jolina! Oh I totally get what you mean about the million layers. Then when you get indoors you’re burning up because of said layers haha. Such is winter! We had a snowstorm over the weekend, it was pretty but made for a nasty commute. Stay warm too my friend! I know it!!! It’s a miraculous cure!! !